Happy Monday everyone. Wife and I just picked up our 2014 310 Signature on Friday. Being the excited children that we are, we took her directly to our club and spent the weekend aboard. 1) We took her to the fuel dock and have a couple of questions about fuel generally. The dash gauge seems to be not worth much. The gauge was reading just below 1/2 before fueling, and after pumping 50 gals into the tank, read just above 1/2. In an airplane, I'd use a dowel rod to measure the fuel. The position of the tank in the boat doesn't seem to allow for that. How do you guys get yourselves confident that you know how much gas is in the tank? 2) Also on the topic of fueling... The tank wouldn't take fuel at the same rate that the pump would deliver. I had to hold the pump handle about halfway depressed to get fuel into the tank. Is this normal? This made me paranoid about the filler hose backing up, and me wearing a shower of fuel, or getting a bunch of fuel on the transom or in the water. Do you guys trust the pump shutoff? I basically listened for the sound to change, and when it did, I assumed that meant the fuel was backing up the fill hose. I'd appreciate some thoughts on this. 3) We have the 5.0 Mercs w/ Bravo 3 drives on our boat. In our old 230 Suncoast outboard, we'd trim the engine up quite a bit to get to that happy place on plane where you're trimmed up efficiently, but not porpoising. In this boat, it took very little trim up before loss of power started (deceleration / coming down off of plane) happening, which I assume means I'm trimmed up enough to have cavitation. I ended up using the trim tabs more to get the bow down, and *barely* trimming up with the drives. Sound right? Thanks in advance to everyone. The generosity of time that people put into this forum is amazing. I must have read 150 forum threads in the week and half since we made and offer on this boat. The accumulated knowledge has been invaluable. That's interesting. Is there a procedure thats easy to follow for someone who has never put a wrench on a boat before? The gas gauge is, at least to me is very inaccurate. For a few reasons, the keel is not level when the boat is in the water. the fuel will move side to side, going over 20 knots or so the fuel will seat more in the rear of the tank. I installed fuel flow sensors on each engine. This tells me my gals per hour or GPH rate. With a full tank and going long distances, its easy to monitor. On the fuel overflowing. -- Check the fuel vent and is the spout of the fuel pump going as far as it can into the fuel port/entrance? lol. You mean not everyone understands what eccentric bushings are? Congrats on a beautiful boat. Go to minute 2:24 - 3-27 and you'll see how that pin is taken out from the hydraulic cylinder ends using the two 5/8" wrenches. It's easier to see and understand this way. Then follow the rest of the directions above on rotating that white eccentric bushing and reassemble. Take pics with your camera phone as you go along so if you get stuck reassembling, you can refer to them. I don't trust the pump shutoff at all. What I do (and since my boat is different than yours, this might not work for you but maybe it will help in other ways) is that I open the hatch all the way and I can see the gas tank end through the opening while I'm pumping. As soon as the gas reaches 2" bellow the top of the gas tank is when I stop the pump. Not sure if you have access to the gas tank and/or can have someone look at it while you're filling up and warn you before it tops off? That would be the best way to do it. As for not filling at the same rate, there could be some issues with the vent tube or the fuel hose just has a lot of turns and bends to get to the tank and that's slowing it down. Or that pump is just too fast, like commercial diesel pumps that pump at a much higher rate than normal ones. I'd suggest keep pumping the way that works for you and try different gas docks for now. As long as there isn't any excessive fuel odor coming out of the bilge/tank area, it could be just normal. Also, as far as filling up 50 gallons and the gauge only moving up a little, don't forget that you probably have a large tank and 50 gallons is not much for a boat that size. My gauge seems to be accurate and it moves appropriately, so yours being a 2014 Sig 310 should work fine. Try filling up the entire tank and then check the gauge, it should read full. Do you know what size tank you have on the Sig 310? And you can also listen. You can hear the fuel start to go up the hose. Another way to tell its full. A dealer or the factory can tell you how long the filler hose is to the gas tank. Any fuel hose can be too long & kinked or flatened over time. Also make sure the vent is on the top of the fuel fill port. Sometimes they are installed upside down and this causes slow filling. The fuel tank on the boat is metal, so can't watch for it to be 2" from the top. I'll figure out where the vent is next time I'm at the boat, and check that out. I'll also check out the filler hoses for twists, pinches or other obstructions. The tank is 118 gallons. I've been listening for the sound to change to indicate that the fuel is starting to back up the hose, which gives me confidence that I'm not going to back up into my face. The problem with this is that I have no confidence in how much fuel is in the tank. I'd like to know so that I can do a long run from Marco Island to Key West, and not run out of gas in the gulf. Thank you. Where would I look to see this? Thanks guys. I think I'll keep using the boat in it's current configuration for a few more months, and keep this in my pocket for future consideration. I'm sure I have alot of gains to be made based on my own skill driving the boat for now. Another reason for a fuel sensor to show GPH. But you have a 2014 model. I believe that the tech can display that info. If not, you can tap into the data flowing into the tech from the engine's computer. I have a 2011 model and its worked for me. But, as to running out of fuel. You should always plan on a 1/4 of tank as a reserve. You coud run into bad weather would burn up more fuel. The smartcraft display shows GPH while running. I'm just paranoid that I don't know how many gallons I'm starting with if I can never be sure that the tank is full. Take the gas cap off and there should be a small vent opening and it should be at the top. A give away that the filler tube is upside down is that the word gas on the cap is upside down when tight. Also check vent line from gas tank to filler tube to make sure there are low places, should be a straight shot to tank. Yeah an aluminum tank won't work trying to look at it filling up vs the plastic one. They do make fuel tank level indicators that are separate from the fuel float sender and helm gauge indicator. It's basically a mechanical float with an analog display to tell you how much fuel is in there and if it's full right at the tank. Something like this. You'll just have to be VERY careful if you DIY for obvious reasons. A pro shop will most likely have you burn out most of the fuel and drain the remaining before tapping a hole in the tank to install that. That will pretty much cure your problem. It's interesting because I've never thought of any other way to know if it's full without looking at the tank and now it makes me think if filling it the same way we fill our vehicles would be something that would work. It should, but tough to trust those dock fuel pumps. And what would be the alternative in this case? 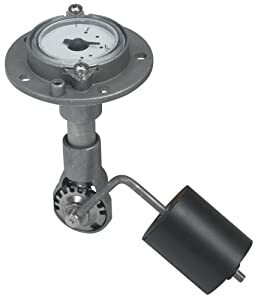 Is it safe to have the key just clicked to engage the helm gauges and watch the gauge fill up? Either way, the float and sensor are almost always delayed to the filling anyway, just like in cars so that will only get you close enough. And if you put 50 gallons in a 118 gallon tank and it only went up from less than half a tank to a little over half a tank, then something isn't right. That's almost half the tank's capacity so you should've been near full after pumping 50 gallons. The problem with this is that I have no confidence in how much fuel is in the tank. I'd like to know so that I can do a long run from Marco Island to Key West, and not run out of gas in the gulf. That's roughly what, 230 miles? Here's a thread on exactly what you need to know and how about the luck that it happens to be your exact boat? 2014 Signature 310 performance numbers. Given that info and the trip is roughly 230 miles, 230/30mph = 7.7 x 22GPH = 169 gallons. Unless my math is incorrect (which is a HUGE possibility LOL), you'll have to stop in one of the halfway Keys to fill up. 230 miles is a long distance for a twin-engines boat and only 118 gallon tank. Some of the larger Signatures (even of that year they made a Signature 370) had 2 - 115 gallon tanks, one for each motor. I hope this helps. That gauge for the tank itself is interesting. I'll talk to a shop about cost to install. My chart (navionics on my phone at work right now :)) shows Marco Island to Key West at about 95nm. If I conservatively assume 22 gph and 25 mph, we're at 3.8 hours and 84 gallons of fuel. That is getting really close to the longest run I would ever feel comfortable making in this boat. In this case, the midway point is really far offshore, so the consequences for failure are high. Where the heII did I get 230 miles, then?! Google must've given me something else. Huge difference between 230 miles and 95 miles. Sorry about that. In that case I think you'll be ok. BUT...just FYI, your Smartcraft low fuel level alarm will most certainly come on once your down to a certain level. Not sure what it's set at on your boat, but mine went off recently for the first time around just below 1/4 tank. Scared the living daylights out of me even though we weren't too far offshore. So keep that in mind. You mentioned newbie in your thread title, is this your first boat ever? We're newbies to owning a boat like this. We've owned an outboard bowrider (Suncoast 230), and have some experience sailing other people's boats. This is our first IO, and the first time we've owned a boat with most of the systems found on her, including AC power, generator, vacuflush head, windlass, etc. Very cool. Love the Suncoast. You're all set, then. All those other systems should be easy to get used to. There's a another member who just bought his first boat ever, a 2012 Signature 330! You don't see that everyday, but seems to be doing well with it, and made easier with the Axius joystick system that came with it. The joystick totally feels like cheating compared to docking a single engine outboard or an inboard sailboat. I'm just scared of the repair bill if it ever breaks. If it breaks ? You will hatemopolus. I have volvos. So its very different. I hear ya. Those joystick systems are not cheap, for sure but you should be alright if you use it correctly and don't abuse it. Short and small movements are best and do the trick. Plus there's 2 settings if I'm not mistaken. One for low speeds during docking etc. and the other for higher speeds, basically once your underway. Not sure if there is a limit to the speed where the joystick will only work, that's possible but I'm not sure. Either way, best way to keep it in good use all the time is use it under the correct speed settings and easy movements. The Merc Axius knob is different than the VP EVC. Yours is basically a completely round knob you can spin or move in any direction 360*. The VP EVC looks more like an aircraft joystick . Have you tried using the higher setting? lol. I keep telling people it's not pronounced that way, as in hate. It's pronounced like hat, as in a hat you wear on your head followed by um. Clopadopadopadus. 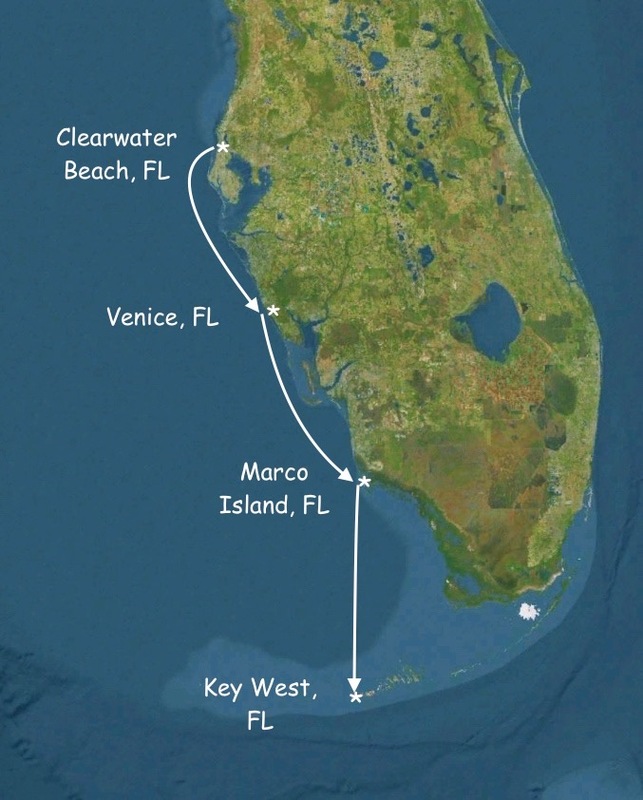 BTW, I looked at the map again and from Marco Island to Key West is almost exactly due south heading. It looks dead south that I bet on a compass the arrow would be dead on South heading, or north or however that works. Maybe a few degrees west. My Smrtcraft display reads fuel flow, and I have a VP. Yours should too.